Tags: Drug Discovery, Successful Research Tips, Toxicology, We Are Enzo! Enzo Life Sciences now provides 25 years of experience in the supply of research kits, biochemicals and biological. As Scientists Enabling Scientists, Enzo Life Sciences realizes the value in providing relevant information to our customers working in the fields of Life Science and Drug Discovery. We are happy to provide simple but useful tips for improving daily tasks as well as the overall quality of your research. With this in mind, here is a list of tips compiled by Mr. Brad Larson, principal scientist at BioTek Instruments, for achieving high quality images by cellular microscopy. Sample preparation is critical to ensure high quality images. Cells should be at an adequate density when harvested from the tissue culture flask, and removed with an appropriate dissociation solution to retain essential cellular function. Use aseptic technique to prevent contamination during the experiment and avoid unnecessary introduction of foreign particles or cellular debris that can negatively impact image quality. For live cell assays, fluorescent probes need to be cell membrane-permeable to assess structure and function within the cell. Optimize concentrations and incubation times prior to performing the actual assay to maintain cell viability while still ensuring sufficient fluorescence. Be aware of potential background fluorescence – it may be necessary to incorporate wash steps before imaging. Together, these will help to provide images of live cells with good signal to background ratios. For fixed cell assays such as immunofluorescence, always use a proven fixing / permeabilizing / staining protocol, including addition of a blocking agent to prevent non-specific binding, and optimization of antibody concentrations when necessary. Newer microplates, developed specifically for imaging, have bottom thicknesses closer to that of a cover glass. When imaging with lower numerical aperture objectives (<0.7), vessel bottom thickness is not a great concern. However when air objectives with high numerical apertures (0.8 or greater) are used, variations of just a few micrometers in vessel thickness can cause image degradation. Aberrations get worse as the vessel thickness increases. A correction collar is used to compensate for these errors. 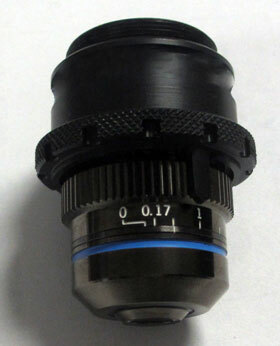 The collar allows for adjustment of the positioning of the central lens group within the objective and insures proper image focusing no matter what type of vessel is used. Typically cell-based assays are more robust when there are more cells. Cellular imaging is a bit trickier; plating too many cells can cause cells to grow on top of each other, confusing proper segmentation of cells for cell counting or other assessments. Plating too few cells can be statistically insignificant and skew cell sub-population analysis. Post-plating and post-treatment incubation times should also be factored into cell number determination, as cell propagation can continue during the preparation and execution of the experiment. A wide variety of cell types can be used for cellular imaging, including immortalized cell lines, primary cells, and stem cells. Most cell types used in microscopy applications are adherent in nature; with the right treatment, the cells will adhere and form a two-dimensional (2D) layer of cells across the bottom of the well. 2D is the most straightforward format for imaging, as the cells are in a single plane which can be found using the auto-focus capability of the imager. Suspension cells, such as erythrocytes and leukocytes, can also be imaged. These cell types lack the ability to adhere to a surface and require additional manipulation to restrict them to a single focal plane at the surface of the vessel used for microscopy. Suspension cells can be transferred onto a microscope slide with coverslip or hemocytometer with cover glass which restricts the cells in the axial direction and provides better image clarity. With microplates, a centrifugation step can also be used to induce cells to the bottom of the well. More complicated biology, such as tissues and three-dimensional (3D) cellular structures, have also been incorporated into image-based experimental processes. The difference in size and shape compared to individual 2D-plated cells, make more advanced imaging procedures necessary. Tissue samples can often be much larger than the field of view provided by the microscope objective, particularly if high resolution is desired with high numerical aperture objectives. An image montage procedure captures numerous images across the entire tissue, which can then be stitched together into a single composite that which can then be used for analysis. 3D cellular structures contain hundreds to thousands of cells, which extend not only in the x- and y-axes, but also in the z-axis. Capturing a z-stacked set of images across multiple z-planes, coupled with z-projection image processing allows for a composite image with better focus than any one of the individual z-stack images. This z-projected composite image can increase the accuracy of any subsequent analysis. It’s essential to use the best fluorophore for successful imaging. Excitation and emission spectra of the fluorescent probe or protein should be matched with LED light sources, excitation and emission filters, and dichroic mirrors available to assure satisfactory fluorescent signal. The fluorophore’s Stokes shift is an important variable to consider as narrow Stokes shift can lead to excessive background fluorescence and poor signal to background. Additional optimization is necessary if multiple fluorophores are used together in a multiplexed format. Molecular spectra tend to be broad and overlap in both excitation and emission spectra can occur, resulting in bleed-through of one fluorophore into the fluorescent channel of another. This is particularly important should both fluorophores be co-localized in the same area within a cell. Autofocusing is the most popular method used in automated imaging. A label-free assay requires brightfield or phase contrast imaging channels to be used for image focus - unlabeled cells provide limited contrast from background, so proper illumination of the sample is critical. It can be helpful to initially use manual imaging to find the z-height where samples are appropriately focused. Incorporation of this value into vessel z-height should be added to vessel definition specifications in software so that the proper z-height is used to begin the auto-focus process, which can minimize focus time. With fluorescence imaging, auto-focusing may be accomplished using the signal from an included fluorescent label. While this works to improve the ease of focus in many situations, certain caveats still exist: a fluorophore with a strong signal allows for the proper focal plane to be found easily, minimizing time spent focusing on each sample. Conversely, a fluorophore with a weak signal, or high background signal, lowers contrast within the image and can cause images to be out of focus. Localization of the fluorophore to the specific area of the cell also needs to be taken into account when using objectives with high numerical aperture and limited depth of field. 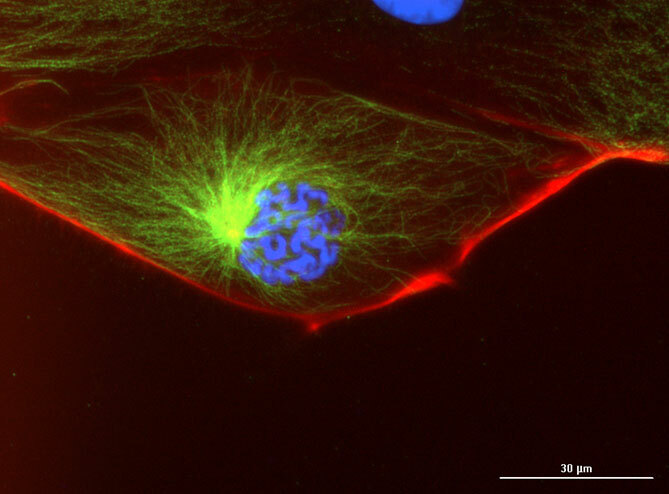 Use of a nuclear stain will lead to accurate focusing on the nucleus of a cell, but when using. A second channel to image fluorescence emanating from a fluorophore localized to the plasma membrane, the image may be improperly focused, as the two cellular compartments exist on slightly different focal planes. A fixed z-offset can accommodate this difference and can easily correct for the disparity. Finally, fixed-focusing can be used in lieu of auto-focus, when a high degree of confidence exists that samples exist at the same focal plane across multiple wells or fields of view. Fixed-focusing can also be used when a cursory view of the state of an experiment or process is necessary. By eliminating the auto-focus procedure, imaging is immediately carried out on all samples, in the fastest possible processing time. Appropriate image acquisition settings are critical for obtaining meaningful, quantifiable data and images suitable for use in publication. These settings typically include excitation light intensity, camera gain and integration time. Qualitative microscopy uses image acquisition setting, that provide the best looking image. Quantitative digital microscopy adjusts exposure parameters such that the entire bit depth of the camera is used as much as possible. When using a fixed exposure for all wells included in an experimental imaging step, use positive and negative controls, if possible, to establish exposure settings. This will help avoid pixel saturation, while maintaining an exposure that will also accurately quantify changes in fluorescence amongst test samples. Saturated pixels cannot be accurately quantified causing the dataset to be truncated at the maximum end of the dynamic range. Conversely, parameters that are set too low, often used to hide “background” cellular fluorescence, truncates the data at the minimum end of the dynamic range and again skews quantitative measurements. Manual imaging can also be used for this function, with the final parameters then being transferred to the automated imaging step. If a change in fluorescence is expected between test wells, or between sample and control wells, the auto-exposure function should not be used, as the imager will attempt to compensate for high and low signals by adjusting the parameters accordingly. This will result in a normalization of the data, and elimination of the expected assay window. Auto-exposure is useful to start the optimization process, if single samples are being analyzed, or if a comparison between actual signal values is not part of the analysis criteria. Kinetic imaging to track cellular changes in real time can yield important nuances that might otherwise be missed in a single end point image. An additional benefit to kinetic imaging is the ability to create a movie from the images captured over time, allowing for visualization of an expected change, in addition to numerical quantification. As with all imaging, however, certain guidelines must be followed to guarantee the best possible images are captured and data obtained. Fixed exposure is recommended for the kinetic experimental procedure. Most likely, there will be a desire to quantify the change to the sample that will occur over the incubation period, and fixed exposure will prevent data normalization over the kinetic time period. If a reduction in signal is expected, use a positive control for parameter optimization. If an increase is expected, use a negative control. Take care, however, to not choose a setting too low which will not allow the expected change in signal to fall within the linear range of the assay. Fluorophores should also be stable, with low susceptibility to photo-bleaching during the entire length of the imaging procedure. Pixel shift occurs when a filter in an imaging path diverts the light rays, resulting in a shift of the image detected on a high-resolution CCD camera. Typically this is caused by emission filters not being of uniform thickness, referred to as filter wedge. This shift becomes problematic when two or more images of the same object are acquired using different filter sets and then overlaid in order to simultaneously view fluorescence from multiple fluorophores. Images produced by different fluorophores will not be accurately correlated or combined because each image is shifted by a differently according to the wedge angles found in each filter set. Because even the most expensive objectives and filters will have some aberration, calibration routines are used to correct for this phenomenon. With automated digital microscopes, this is often done during the LED and objective calibration steps. Using brightfield as a reference of illumination, each LED and objective combination is tested for pixel shift by determination of the center of an aperture. The calculated pixel shift for each is then used to offset images such that overlays are in their proper location. Individual colors from multi-color images can also be repositioned after imaging using a channel shift tool in some digital microscopy software. 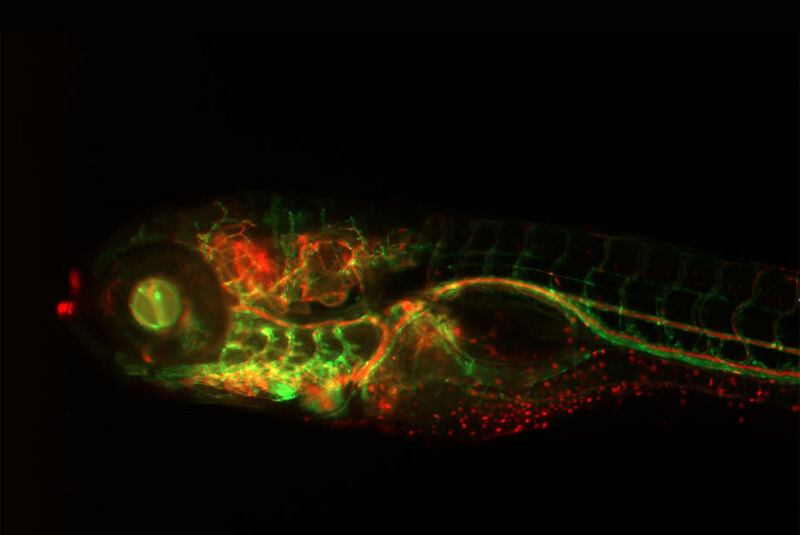 For example, a live specimen moving during separate fluorescent color imaging steps can result in slight misalignment of the different colors with overlaid images. Because different color channels are imaged in sequence there is a short temporal interval between images that can capture specimen movement. The channel shift tool allows the researcher to reposition the channel in order to correct for the movement. Long term kinetic live cell imaging typically requires some control of environmental conditions to maintain sample viability. Temperature is a main consideration. While most mammalian cells grow at 37°C, if bacterial or yeast cells are used, higher or lower temperatures may be required. Manual pre-setting, or inclusion of a temperature control step into the procedure, can ensure that proper temperatures are maintained while imaging is performed. Atmospheric control can also be critical. For example, maintenance of 5% CO2 / 95% air within the imaging chamber provides an appropriate atmosphere for mammalian cells. When combined, provision of the correct temperature and atmospheric conditions can allow live cell imaging to take place without sacrificing sample integrity over long kinetic reads. From simple organelle-specific dyes for imaging cell structures and determining cell viability to more complex dyes and reporter assays for monitoring cell signaling, death pathways and toxicity, Enzo Life Sciences offers a comprehensive CELLESTIAL® portfolio of fluorescent dyes for unique probe-based assays by cellular microscopy, some of which are described below.